And so it begins anew -- the semi-annual autumn bloodletting at the newspaper I used to call home. 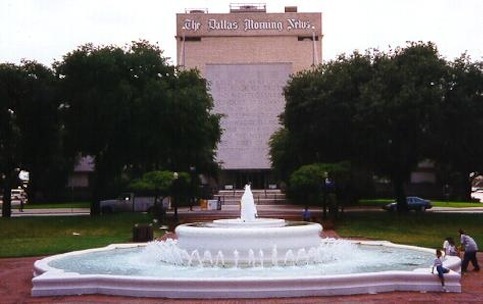 October, 2004 -- Roughly 70 staffers at The Dallas Morning News were laid off. I remember the day, waiting for the phone not to ring. Or if it did, hoping it would be from a TV publicist instead of an editor bringing the good news/bad news equivalent of, "Hey, I really liked your piece the other day. But you're fired." September, 2006 -- This time buyouts were offered. And 110 newsroom staffers took one, including the proprietor of unclebarky.com, which went up two days later. The initial "magic number" was 85, but that later became open-ended. A lot of veterans whose salaries had risen over the years became convinced that if they didn't act now they'd pay the price later. This assessment certainly wasn't discouraged by management. Mid-September, 2008 -- That's the latest doomsday announced to "fellow shareholders" Monday (July 28th) by A.H. Belo Corporation chairman and CEO Robert W. Decherd. This time the corporation wants a stunning 500 "full-time equivalents" (or FTEs as Decherd subsequently referred to them) to be sliced from The Dallas Morning News and Belo's two other, much smaller newspapers, The Providence Journal and The Press-Enterprise in Riverside, CA. It's very safe to assume that at least 350 of those positions will be carved from the DMN, with a "voluntary severance process" already underway Monday as employees began receiving individual offers. Otherwise Decherd is promising an "involuntary reduction-in-force." Easy to say for a guy whose bonuses still kick in like clockwork through thin and thinner. It's maddening, but mostly saddening. And it's not as if newspapers around the country aren't reducing their workforces by leaps and bounds. Still, many of us who experienced the constant re-directions and boondoggles demanded by Belo upper management can't help but wonder whether it really had to come to this in such a big damned hurry. As anyone who's worked for the latter-day DMN knows all too well, though, employee ideas for product improvement were basically beside the point. And Decherd of course remained completely inaccessible to the grunts. Tellingly, his letter to "fellow shareholders" Monday was about three times as long as the companion missive to "colleagues," in which he wrote of "rapidly transforming A.H. Belo's businesses to take advantage of opportunities that are available to great local newspapers like ours." Great? One doesn't have to revert to "good ol' day" syndrome to know how empty that sounds. A good number of high-quality reporters remain at the DMN. But any of them, whether old-timers or relative newcomers, would be lying under oath if they said the paper was even close to what it was throughout the 1980s and most of the 1990s. My old section, Guide/Live Daily, is an emaciated four pages for half of its week's editions. Even then, a disheartening amount of the incredibly shrinking space is filled with wire copy and plus-sized pictures. It would be a shock if the section survives into the new year. And although this sounds harsh, who would really miss it anymore? While the newspaper struggles and its attendant Web site is widely panned, Belo's other prime Dallas holding, WFAA8, came off a May "sweeps" rating period in which it increased its year-to-date audience in the two most important TV news battlegrounds -- 10 p.m. and 6 a.m. The station ran first in each of those time periods. And it did likewise at 5 and 6 p.m., despite some audience erosion. WFAA8 is brimming with vitality in its still relatively new Victory Park studios and as the market's first station to present high-definition newscasts. Meanwhile, how much "there" will be left at the DMN after several hundred more bodies leave the building? Will consumers find it useful to rely on the newspaper's already hard-to-navigate Web site after many of the DMN's seasoned reporters give up the ghost and take whatever "package" is presented? As I type this, I look to the wall on my left and see the framed, mock "GuideLive" front page that's been in place since the Sept. 17, 2006 launch of unclebarky.com. Headlined "The Great Escape," it was distributed on the final day at the DMN (although some stayed a while longer during a transition period) for entertainment editor Rick Holter and staffers Charles Ealy, Dotty Griffith, Norma Cavazos, Susan Verhault, Anne Bothwell, Jerome Weeks, Toni Edwards, David Dillon, Janet Kutner, Philip Wuntch and yours truly. It's meant to be inspirational. This time, Belo also plans to sell off some of its downtown property, but doesn't expect any sales to be final until mid-2009. Land, bodies and beyond. It all makes for a very gloomy scenario as the DMN again downsizes itself. But to put it in Decherd's words in his letter to shareholders: "We believe that the resultant, smaller workforce -- focused intensely on products that take full advantage of A.H. Belo's local capabilities in content creation and sales -- is best suited for the business opportunities that will define future success." That's the third time he's written that in the past six years. My head bows, my anger rises and my thoughts and sympathies are with all the FTEs who will soon be on the streets.